Need a route? Leave me start & finish cross streets or addresses and I’ll scout out a route. Biking to Sundae School on Beechwood for some yummy ice cream! Sundae School is a brand new ice cream parlour on Beechwood Avenue. A couple of Chinatown residents are in need of a bike commute route to get there. The rest of us need a consume route because the ice cream is super delicious! The blue line on the following map is the route Carla and I rode to get there. The short purple line is a slight variations heading back. UPDATE – Summer 2018: Sundae School moved a couple of blocks south along Beechwood, on the west side of the street. Their new location is indicated on the map. Bike lanes have also since been added along Beechwood from when this route was originally posted, as indicated by the green line on the map below. We begin at the corner of Primrose and Empress, right in front of the Dominican University College. We rode east along quiet Primrose Avenue, then turned left on to Cambridge St North. This took us to Laurier Street. The segregated bike lane along Laurier starts on the other side of Bronson Avenue. We followed the Laurier Bike Lane all the way to City Hall. We then turned off Laurier at the exit ramp just before heading over the bridge, which took us down to Queen Elizabeth Drive. There isn’t a bike lane along the short exit ramp, but the lane is quite wide. That said, some do feel safer taking to the very wide sidewalk, while others cut through Marion Dewar Plaza infront of City Hall to Queen Elizabeth Drive to avoid having to ride along the exit ramp. If I was taking kids for an ice cream outing I would do the same. 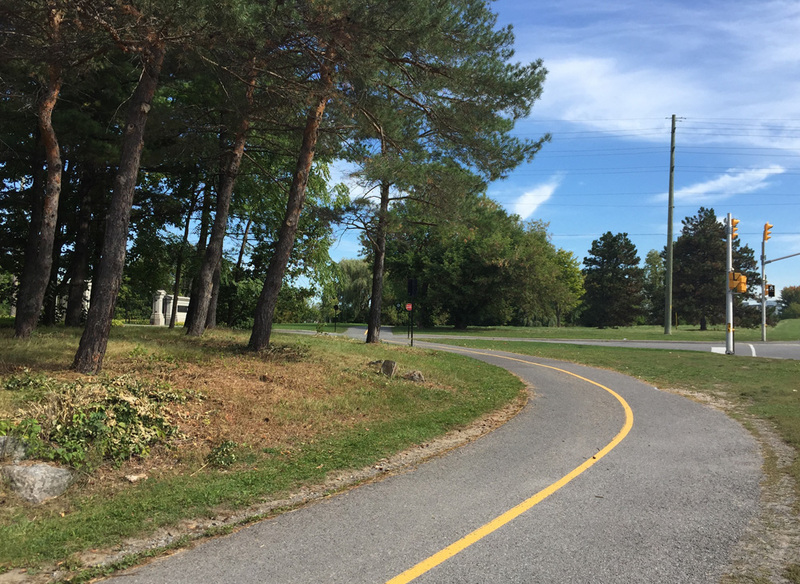 There are three way stop signs to facilitate cyclists and pedestrians wanting to cross Queen Elizabeth Drive to get on to the Rideau Canal Western pathway. Ww rode over the Rideau Canal via the Corktown Bridge. We crossed Nicholas Street at the lights and rode through the Ottawa U campus to King Edward Avenue. After crossing King Edward we sailed down Somerset East all the way to the Adawe bike & pedestrian bridge. 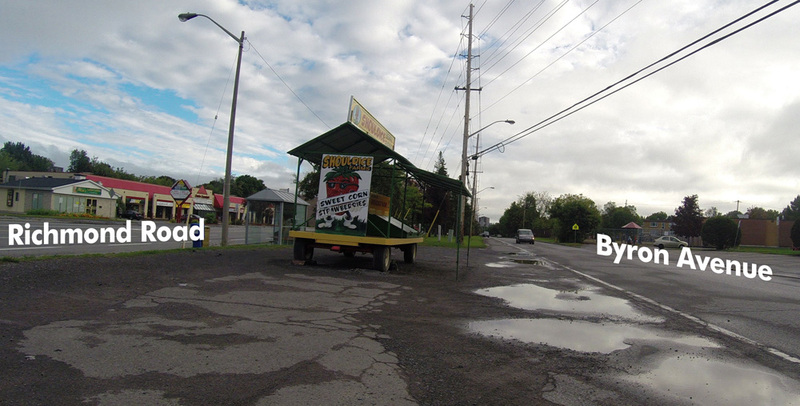 This section of Somerset has a potpourri of vanishing and re-appearing painted bike lanes. It usually has lots of other cyclists too, as it serves as a well travelled bike link between the two non-car bridges. 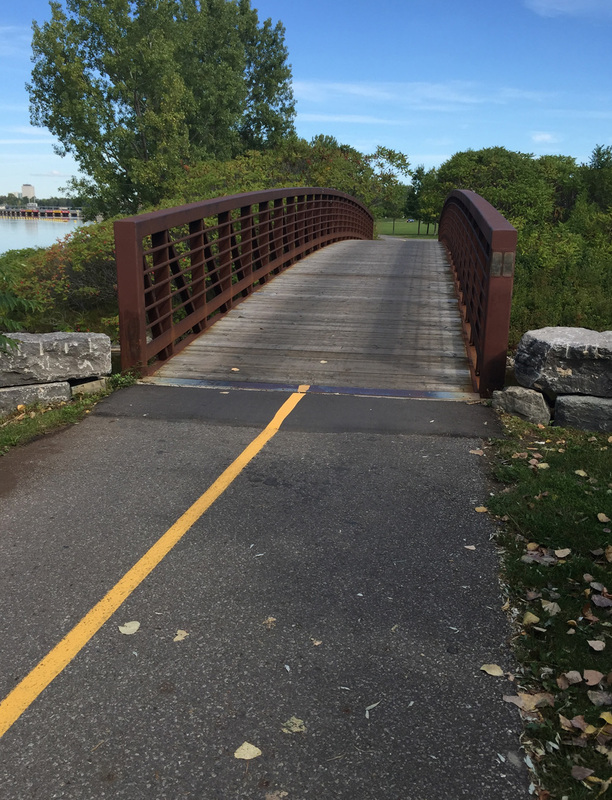 Once over the Adawe Bridge we turned north along the Rideau River Eastern Pathway. The pathway crosses Montreal Road. Many drivers tend to be extra antsy and aggressive at this intersection. Advance cross lights for pedestrians and cyclists would be helpful. We continued along the pathway, eventually arriving at St Patrick St where we could have turned up onto Beechwood but chose not to. That’s because the section along Beechwood for a couple of blocks immediately north of the river is attrocious for biking – very tight space with parked cars offering lots of dooring potential, and impatient drivers roaring up behind you on adrenaline rushes after flying along the St Patrick Street speedway. UPDATE- Fall 2017: This has all changed! as mentioned in the intro, there are now bike lanes along Beechwood (see green line on the above map). That said, the original route described below is still legit. We continued along the Rideau River Pathway under St Patrick before turning onto a short gravel path that took us to Crichton Street. We rode east half a block along Crichton to get to Vaughan Street – a quiet residential street heading north. This brings you to Putman Avenue. Their new 2018 location is at the corner of Putnam and Beechwood. Sundae School (in their original 2017 location) ! Once we had finished our well deserved treat (I highly reccomend the chocolate flavour) it was time to head back. The only variation on the route back was getting from the Rideau Canal Pathway to the segregated section of the Laurier Bike Lane that starts west of Elgin street. To get to the inersection of Laurier and Elgin we rode under the Laurier Bridge, then cut through Confederation Park. Author ottawaveloPosted on May 24, 2017 July 4, 2018 Categories Commute Routes, Ottawa, Suggested rides for visitors to the regionLeave a comment on Biking to Sundae School on Beechwood for some yummy ice cream! The Ottawa Train Station is located a few kilometers outside of downtown. Here is a bike route to get there from Centretown. I started off from the intersection of Laurier & Bronson avenues and headed east along the Laurier Bike Lane. After passing in front of City Hall I took the exit towards Queen Elizabeth Drive and got on to the Rideau Canal Western Pathway. UPDATE – July 2018: They’ve installed bi-directional multi-use lanes on the sidewalk just after you exit off Laurier. I rode south along the Rideau Canal Western Pathway before crossing the canal over the Corktown bridge. I traversed Colonel By Drive at the pedestrian lights and rode under the Nicholas Street tunnel, then up through the University of Ottawa campus. After crossing King Edward Avenue at the traffic lights I rode straight down Somerset East before heading up and over the Rideau River on the Adawe Bridge. On the opposite side of the river I turned right onto the Rideau River Easten Pathway. 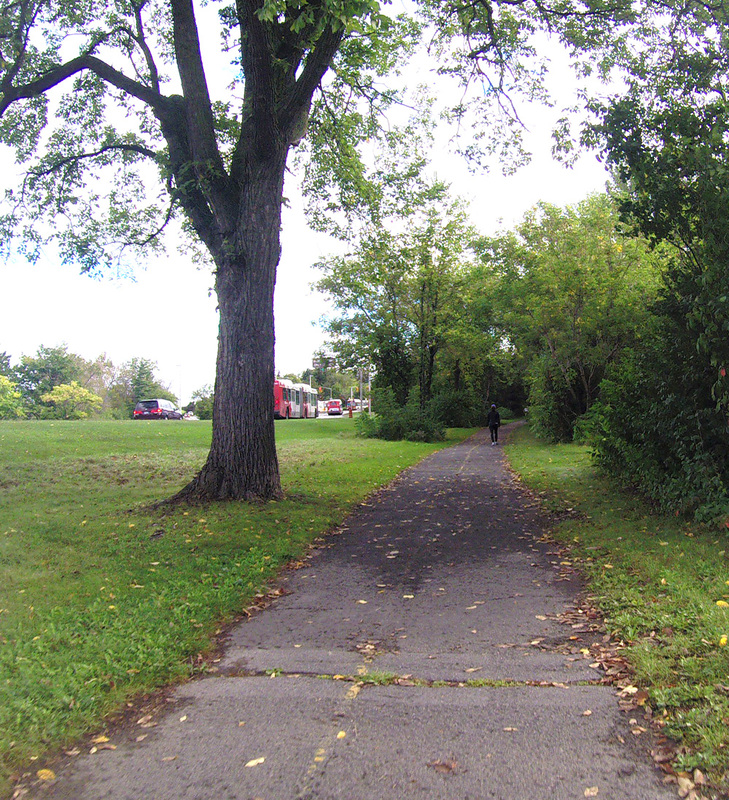 Just after riding under the Queensway along the Rideau River Easten Pathway I turned left onto a packed gravel path that leads to the intersection of Riverside Drive and Tremblay Road. 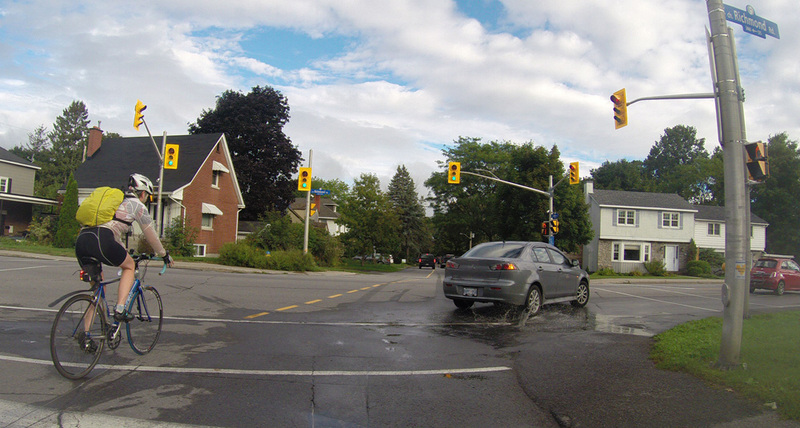 Crossing the Riverside Drive and Tremblay Road intersection is the least pleasant spot along this route. Something about Riverside Drive seems to compel drivers to become impatient speedsters. The oncoming left lane is also a Queensway off ramp with a yield sign to compel drivers to let you cross. There used to be a path that went over Riverside Drive, thus avoiding this intersection, but it is blocked off (temporarily I hope) as the new transit line is being constructed. Once through the intersection I continued along the sidewalk that runs parallel to Tremblay before it becomes a paved path leading up to the train station. I passed all the taxis lining the circular approach to the front of the station to get to where there is a bike rack just to the left of the main doors. This location, along with the security camera hanging right above it, provides me with the confidence to leave my bike locked up to the rack when I go away on a train trip for a few days. It’s a huge improvement from a long time ago when the only option was to lock your bike to a post near the poorly lit car parking lot. That’s where I discovered my bike was stolen after returning from a weekend trip to Montreal. The bike rack out front is much better. On the way back I retraced my route, except for the section along Laurier in front of City Hall. That’s because when heading west along the Laurier Bike Lane, the safe segregated section only starts at Elgin and Laurier. To get there I cut through Confederation Park as indicated by the purple line on the above map. If anyone needs a bike route to the station from another area of town, send me a starting reference point by email or via the ‘Leave a comment’ tag. Greenboro is a residential community located just south of Johnston Road and west of Conroy Road. Here’s a route I tested out that’ll get you from Greenboro to downtown. I started off from the Greenboro Community Centre and headed west towards Bank Street, following a selection of the many multi-use paths that weave their way through the community. After crossing Albion Road and cutting through Pushman Park, I turned right on Pebble Road then Left on South Keys Place to Clearwater Crescent. Across Clearwater Crescent there are a series of paths that cut through to Southgate Road. I rode north on Southgate for half a block before turning into the lane heading into a housing complex called Southgate Square. This I followed a short distance to Bank Street. The next section of the route is less than stellar. That’s because there is no clear safe way to bike across Bank Street to access the Sawmill Creek Pathway on the opposite side of the South Keys Shopping Mall. Once at the end of the driveway there is a shortcut that I took up and on to the sidewalk along Bank. I followed the sidewalk south a short distance to the traffic lights across Bank Street into the South Keys Mall parking lot. The only crossing is on the south side of the intersection. I stayed along the sidewalk on the other side until I was able to access the parking lot. Access to the Sawmill Creek Pathway is though a tunnel under the O-Train tracks at the south end of the mall, so I rode through the mall parking lot to get there. The sign at the entrance to the tunnel is confusing, however I have Tweeted confirmation from OC-Transpo that it is meant to be interpreted as ‘no riding your bike’, versus ‘no bikes allowed at all’. Beyond the tunnel is the Sawmill Creek Pathway, which is wonderful to ride along all the way to where it intersects the Brookfield Pathway. I turned left at the Brookfield Path intersection which eventually brought me to the Brookfield Road round-about. I negotiated the round-about and continued west along Brookfield Road, which isn’t the greatest of roads to ride along. It’s four lanes to Riverside Drive that most drivers tend to speed along. There is no bike infrastructure, even though there is ample room for bike lanes on either side, which would be a huge asset toward encouraging cyclists, particularly since Brookfield High School is half way along this stretch of road. Rather than ride along the road, many riders continue along the round-about to the sidewalk on the south side of Brookfield, which may be a multi-use path considering it is paved and wider in stretches, but I’m not sure. Here are a couple of riders along Brookfield using both methods. I crossed Riverside Drive and continued along the path beside Hog’s Back Road, which is identified as a shared pathway. That said, the path on the south side is commonly used by riders heading west as it is also paved and twice as wide. I stayed on the pathway heading north along Hog’s Back Road. Once arrived at Hog’s Back Falls, one may take the path that goes under Hog’s Back Road and pops up along the multi use path on opposite side over the falls. I’ve hi-lited this option in purple on the above map. This tends to be the more popular option. I sometimes prefer to cross the falls on the east side as it affords a spectacular view over Hogs Back Falls. Only inconvenience is the requirement to carry your bike down a short flight of stairs. The path dips under Hog’s Back Road then down along the Rideau Canal. I then crossed the canal at the locks near Carleton University. There is a metal u-channel to push your bike up the flight of stairs that gets you to the locks. I then rode down the hill along the canal before taking the first gravel path inland. Normally I would continue along the paved path beside the canal, as suggested by the red line on the above map, but at the time I rode this route there was construction along the Champagne Path beside the O-Train so I needed to detour west of the path before joining up with it further north. UPDATE: May 13 – Path has been re-opened between Carling and Young St, so the red line on the above map is accessible. I then rode along the path to it’s northern end before it turned right and headed up to where it links to the path along Albert Street. I followed the path along Albert Street as far as the crosswalk that leads towards the Laurier Bike Lanes. The path continues through the intersection at Bronson & Slater before eventually cutting through to the Laurier Bike Lanes. 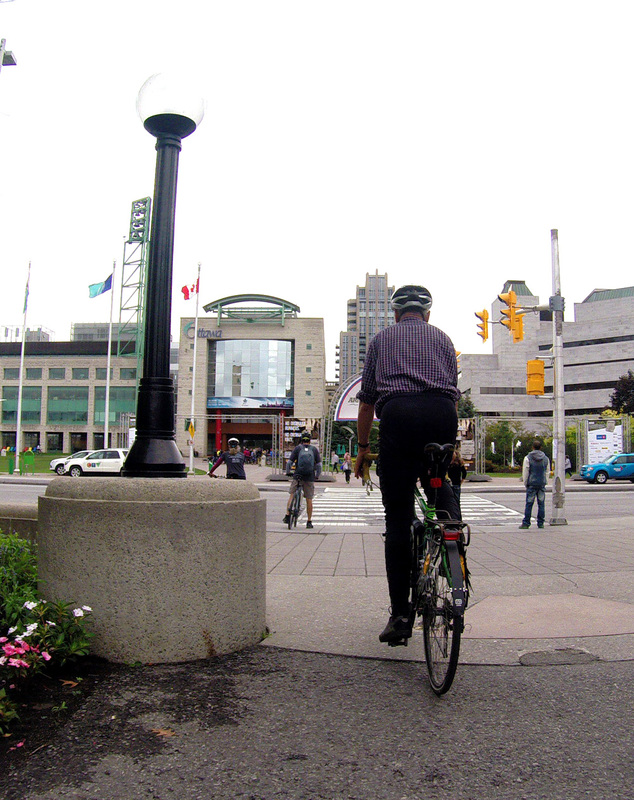 The laurier Bike Lanes cut west to east across downtown as far as City Hall. Here’s a route from the corner of Somerset & Elgin to the Children’s Hospital of Eastern Ontario (CHEO). The blue line on the map below is the route I followed. A lot of road and path construction is happening between our start and finish points. The green line is the route I would take after all the construction dust settles. UPDATE – summer 2018: The construction along Hurdman Bridge has been completed so the green line option is once again an option. I rode down Somerset to the canal and crossed over the Corktown Footbridge. UPDATE June 2017 – Previous version of this took a detour to north as the Nicholas St underpass was under construction. It’s still partially under construction, but you can ride under it regardless. I cross Colonel By Drive then ride under the Nicholas St underpass. I continue straight along Marie Curie, across King Edward at the lights, then down Somerset all the way to the Rideau River and the Adawe pedestrian/cyclist bridge. Once arrived on the eastern shore I turned right and followed the Rideau River Eastern Pathway. After passing under the Hurdman Bridge I turned off the path and rode along the detour past the major construction happening in and around the Hurdman transit station. This path is mostly crushed gravel. The path becomes paved and continues through to the major traffic intersection at Riverside Drive and Industrial Avenue. Once across Riverside Drive I continued along the path that runs along Industrial Avenue beside the memorial to victims of cancer. After crossing Alta Vista Drive the path then veers off to the right away from busy Industrial Avenue. I then followed Coronation Avenue for a very short distance before turning on to Station Boulevard. At the end of Station Boulevard there is a path that cuts through to the ring road that circles the CHEO campus. I then followed the ring road around to the main entrance of the hospital. Because there are no shoulders along the ring road one may feel more comfortable cutting through the parking lots, as suggested by the yellow line on the above map. I noticed a couple of bike racks right near a small playground, indicated by the yellow drop on the map. Here’s a suggested bike route from the Glebe to Centretown, in response to a request from a cyclist in search of a commute route that avoids having to ride along busy Bronson Avenue or Bank Street. This ride begins at the intersection of Holmwood Avenue and Craig Street and ends at the intersection of Bank Street and Somerset Street West. Head north along Craig St. There’s a short jog left where Craig meets Fifth Ave before the route continues north along Percy Street. There is often a fair amount of traffic along Percy Street heading through the Glebe, and there are no bike lanes, however stop signs at almost every intersection seem to help keep drivers calm. A bike lane appears just before Percy continues under the Queensway. It requires easing your way over to the centre of the street. There are traffic lights to help get across the busy three lane speed strip that is Chamberlain Ave. The bike path continues bi-directionally along Percy under the Queensway, however the northbound bike lane disappears a few blocks later at Flora St. Turn east on Flora, then continue north along Bay St, which has a bike lane. This stretch of Bay goes past the Powers House designed by architect Francis Sullivan. Sullivan worked with Frank Lloyd Wright before settling in Ottawa. If the works of Sullivan strike your fancy there’s a tour with visits to this and other buildings he designed within Ottawa that can be found by clicking here. The trickiest part of this route is encountered at the intersection of Bay & Gladstone where there aren’t any traffic lights to help get across busy Gladstone. You have to wait for a break in traffic. The next busy street to get across is Somerset a few blocks further north along Bay. UPDATE – June 22, 2016: A cross walk with pedestrian activated lights has just been installed at this intersection that greatly facilitate traversing busy Somerset. Once across Somerset, continue for a block along Percy, then turn right on to Cooper St. Cooper is a quiet one way street. The next two streets that require crossing are Lyon St and Kent St, both of which are one ways that drivers fly along on their way in or out of Centretown. No cross lights at these intersections but the gaps in traffic tend to be quite generous due to lights being one block away. Being one-ways there is also less traffic to contend with. Once arrived at Bank Street I recommend walking your bike the final block to Somerset because Bank & Somerset is a pretty crazy intersection with cars and buses squeezing around each other or jumping the lights. You can also lock up to one of these sidewalk bike racks. OR you can lock up to this fine bike rack in front of the Independent Grocery, also popularly known as Hartman’s. Heading home, walk another short block along Bank to MacLaren, another quiet one way heading west, and follow it all the way to Percy. Another fine building encountered on this route along MacLaren is the old St Elijah’s Antiochia Orthodox church that was successfully converted into apartments, while maintaining it’s original outer form and aesthetic. It’s at the corner of Lyon and MacLaren right across from Dundonald Park, a.k.a. The Beer Store Park. Once arrived at Percy St, head southwardly along the bike lane back to the Glebe. Fortunately there are lights at the intersections of Somerset and Gladstone along Percy. Nanny Goat Hill is a rise of rock that cuts through a section of Centretown, separating Chinatown from Lebretton Flats. It is roughly defined by the yellow line on the map below and extends from Bronson Ave to Somerset St. A longstanding challenge for many cyclists heading north or west has been how to negotiate a safe way down this mini-precipice. The recently opened path link that cuts below Nanny Goat Hill Community Garden connecting the Laurier Bike Lanes to the Albert Street Bike Lanes, as per the purple line on the map, has done wonders to facilitate avoiding Bronson. It is also the safest option of all for those pulling a trailer. Here is a clip starting from the intersection of Laurier and Bronson down to the Albert Street Bike Lanes. Another north-south option is to take the set of stairs that joins the upper and lower sections of Empress St, as shown in orange on the above map. This set of stairs has a trough along which you can push your bike. Many cyclists ride east-west down Somerset, as per the light blue line on the map, however I’ve seen a number of cyclists get hit by drivers along this stretch. I’ve also seen a cyclist get doored by a someone getting out of their parked car, as well as many other close calls along Somerset. It’s a popular commute route where aggressive drivers have been known to threaten cyclists who dare to take the lane. Suffice to say it is not one I would recommend. UPDATE Augutst 2018 – For example, this cyclist getting hit by a driver, Somerset & Bronson. My preferred east-west option is to carry one’s bike down the stairs that join the two sections of Primrose – see dark blue line on the map. While much safer than riding down Somerset, this set of stairs unfortunately doesn’t have a trough which makes it difficult for those with heavier bikes, loaded panniers or little kids in tow. Et voila – a few options to get down or around this challenging geographical feature. 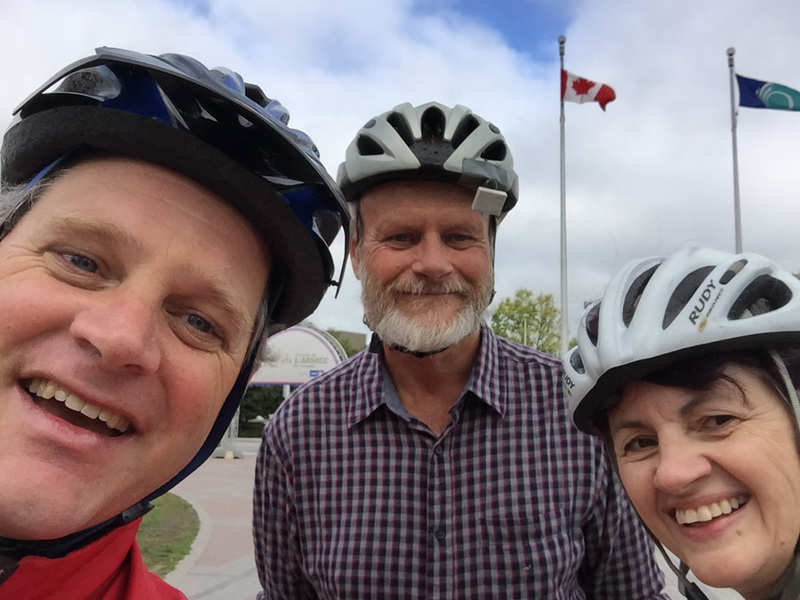 The Ottawa Centre EcoDistrict organized a great event to promote bike commuting, as well as hi-lite potential improvements to infrastructure that will further encourage cycling to work. Groups of riders started off from various locations around town and arrived at the final destination – City Hall, where the mayor and a number of city councillors were there to greet us. Our group of three started off from the intersection of Woodroffe Avenue and Richmond Road. Here’s the route we followed, along with observations for potential areas of improvement that we made along the way. Byron Avenue runs parallel to busy Richmond Road. Richmond draws most of the commuter car traffic so we headed east along Byron. There is the odd aggressive driver along Byron that many potential cycling commuters understandably prefer to avoid at all cost. An alternative solution would be to follow the shared multi-use path that runs between Byron and Richmond. One disadvantage of this path is that it starts 10 meters east of Woodroffe along a sidewalk that passes in front of a bus shelter. 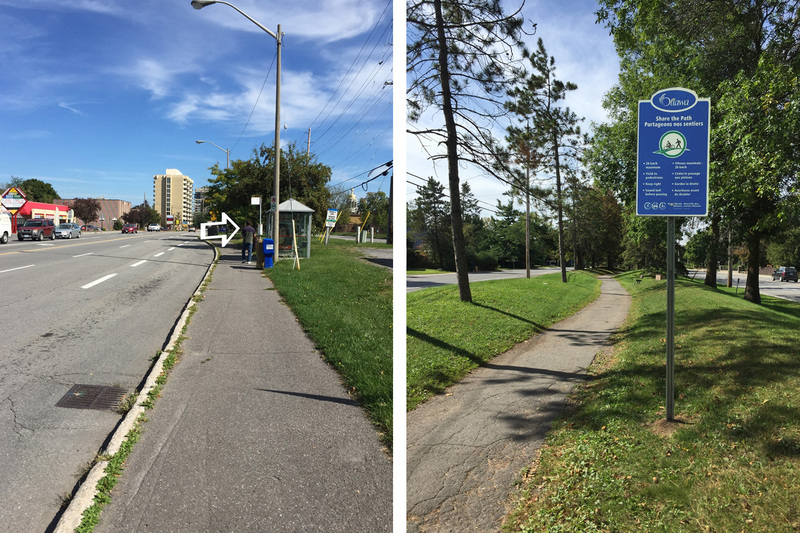 A solution would be for the path to start at Woodroffe extending behind the bus shelter. We continued along Byron, then turned left along Fraser Avenue and across Richmond at the lights. We rode to the end of Fraser, then one block back along Skead St to access the paved link onto the multi-use path that runs along the south side of the SJAM Parkway. This path is poorly maintained. There are cracks that extend across it’s width every few meters creating a very jarring and uncomfortable ride. 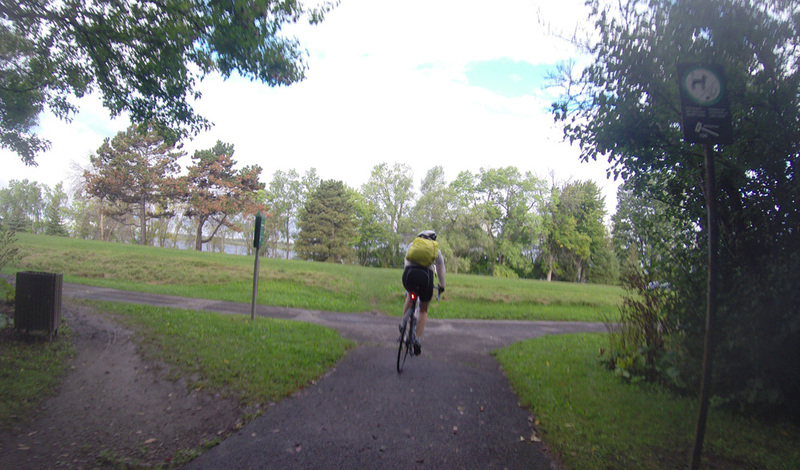 We rode along this path as far Westboro Beach where we crossed under the parkway to the much better maintained Ottawa River Pathway. The crossing at River Street was noted as a potentially dangerous spot, identified by the red marker on the above map. The path takes a quick turn just before reaching this intersection. Cyclists who notice and take heed of the miniature stop sign are quickly overtaken by cyclists approaching from behind. Good to see the gaps have been filled between the path and the ends of the small wooden bridge just to the west of the War Museum. The rest of the ride was smooth sailing. We followed the path below Parliament Hill then up beside along canal before cutting through Confederation park to City Hall. Kudos to the Ottawa EcoDistrict and their partners for organizing this great initiative, along with all the riders who participated! If you are looking for a bike route to work, or any other destinations around the region, send me two points of reference: a starting point (like a street intersection, or address, or landmark, etc) and the final destination. These can be sent via the ‘Leave a comment’ tag, or by email at OttawaVeloOutaouais@gmail.com . If the start and finish destinations are within an hour’s ride from each other (and most are) I will scout out a bike route and describe it on this blog, or point you to a link if I've aready tried it out.